Happy Diwali Friends. I am writing this in English so that all my friends who do not understand Hindi or Marathi Language can also understand the significance of each day of Diwali. Dhanteras ( Hindi : धनतेरस, Sanskrit/Marathi : धनत्रयोदशी) is the first day of the five-day Diwali Festival as celebrated in India. The festival, known as “Dhanatrayodashi” or “Dhanvantari Trayodashi”.The word Dhan means wealth and Teras means 13th day as per Hindu calendar. It is celebrated on the thirteenth lunar day of Krishna paksha (dark fortnight) in the Hindu calendar month of Ashwin. On Dhanteras, Goddess Lakshmi is worshiped to provide prosperity and well being. Dhanteras holds special significance for the business community due to the customary purchases of precious metals on this day. Silver and steel has got special importance on this day. Lord Kubera, the God of assets and wealth is also worshiped on this day. Also God Dhanvantari (Sanskrit: धन्वन्तरि) is an Avatar of Vishnu from the Hindu tradition. He appears in the Vedas and Puranas as the physician of the gods (devas), and the god of Ayurvedic medicine. It is common practice in Hinduism for worshippers to pray to Dhanvantari seeking his blessings for sound health for themselves and/or others, is also worshipped on this day. The Second Day is called Narak-Chaturdashi or more popularly as Chhoti Diwali which falls on the 14th day of the month of Ashwin, Krushna Paksha. This festival is observed to commemorate the victory of Lord Krishna over the demon king, Narkasur. The story goes that the demon king Narakasur ruler of Pragjyotishpur (Province to the South of Nepal) after defeating Lord Indra, had snatched away the magnificent earrings of Aditi, the Mother of Goddess and imprisoned sixteen thousand daughters of the gods and saints in his harem. On the day of Narakchaturdashi, Lord Krishna killed the demon and liberated the imprisoned damsels and also recovered those precious earrings of Aditi. His destruction made all happy and the women in particular saw his end as a moral victory for them. Another important aspect of this day is ‘ABHYNGA SNAN’. The early morning bath is of significance because the holy water symbolises the end of the evil powers. Since abhyang snan is taken before the sunrise it is considered as holy as taking bath in the river Ganges. 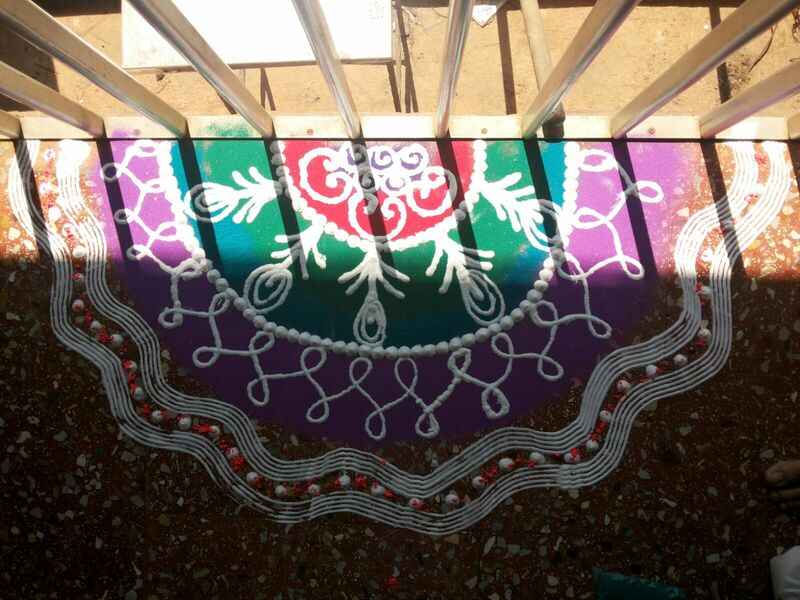 After having abhyang snan, women draw rangolis near verandas and place diyas (lamps). Lampshades signify the arrival of the festival. Children burst crackers. Families enjoy eating sweets and snacks together. Youngsters and adults go to temples to seek the blessings of God. Diwali fills every heart with joy and excitement. The celebration leaves everyone feeling divine. Begin with the abhyanga snan and wash away all your problems. I wish you a very happy and safe Diwali. Lakshmi puja is a Hindu ritual performed on 15th day of Ashwin month which is a no moon day. This is the third day of Dipavali (Diwali), the Hindu festival of lights. According to tradition people would put small oil lamps outside their houses on Diwali and pray to Goddess Lakshmi to bless their family and businesses. Goddess Lakshmi is worshipped by those who wish to acquire or to preserve wealth. It is believed that the goddess ( of wealth) visits only those houses which are clean and where the people are honest and hard-working. Bali Pratipadā (Sanskrit: बालि प्रतिपदा,Marathi: बळी-प्रतिपदा or Pāḍavā पाडवा,Kannada: ಬಲಿ ಪಾಡ್ಯಮಿ or Bali Pāḍyami) is celebrated in honour of the notional return of the demon(Daitya)-king Bali to earth. In Gujarat and parts of Rajasthan the day is celebrated as Padvo or Gujarati New Year. This is celebrated on 1st day of Karthik month, Shukla Paksha (First 15 days of the month, ascending to the full moon). According to Hindu mythology, Bali, an Daitya king was well known for his bravery, uprightness and dedication to god Vishnu. He was benevolent and his popularity was only marred by the actions of his kinsmen who involved themselves with depredations against the gods who stood for righteousness and justice. But Bali was also considered as arrogant and vainglorious and the godly people did not like him for this. Bali was also considered invincible since he was a great devotee of Vishnu. The gods, upset by the harassment meted out to them by the asuras, and jealous of the popularity of Bali – sometimes glorified as Mahabali (“the great Bali”), approached Vishnu to help them to get rid of Bali. Vishnu took the form of a dwarf Vamana. Vamana is Vishnu’s fifth Avatar (incarnation), out of his ten avatars that he is believed to have assumed to triumph over evil and usher peace, prosperity and happiness in this world. Vamana, the dwarf Brahmin, then approached Bali seeking reverence and alms. Aware of the generous nature of Bali, Vamana appeared before him and sought a gift of three paces of land from the king. Bali readily agreed. The dwarf then assumed his huge universal form (vishwarupa or “all pervading”) and placed his first step forward, which occupied the entire universal space. With his second step he occupied the earth, except the space where Bali was standing. Since there was no other space available to put Vamana’s third step, Bali readily offered his own head for Vamana to put his third step, fully realising that the person who was asking for such gift was none other than Vishnu himself. Vishnu banished Bali to patalaloka, the nether-world. Pleased with the generosity of Bali, Vishnu grants him a boon that he could return to earth for one day in a year to be with his people and light millions of lamps to dispel the darkness and ignorance and spread the radiance of love and wisdom. It is this day that is celebrated as the Bali Padyami, the annual return of Bali from the netherworld to earth. It is this day that is celebrated as Bali Padyami by lighting lamps and bursting crackers. All people froim Gujrathi community do chopadi pujan on this day. They start a new year by worshipping new accounting books. They start a new year from this day. Wish all my Gujarathi friends happy and prosperous new year!! Bhau-Beej / Bhai Tika / Bhai Phota / Bhai Dooj is a festival celebrated by Hindus on the last day of the five-day-long Diwali festival. This is the second day of the bright fortnight or Shukla Paksha of the Hindu month of Kartika. The celebrations of this day are similar to the festival of Raksha Bandhan. On this day, sisters pray for their brothers to have long and happy lives by performing the Tika ceremony, and sisters give gifts to their brothers. Legend says, Yamraj, the God of Death visited his sister Yami on this particular day. She put the auspicious tilak on his forehead, garlanded him and fed him with special dishes. Together, they ate the sweets, talked and enjoyed themselves to their heart’s content. While parting Yamraj gave her a special gift as a token of his love and in return Yami also gave him a lovely gift which she had made with her own hands. That day Yamraj announced that anyone who receives tilak from his sister will never be thrown. That is why this day of Bhai Duj is also known by the name of Yama Dwitiya. On this day specifically a lamp is put facing South, which is considered as the direction of Yamraj. The traditions differ from community to community. India being a diversified country, I cannot be perfect in mentioning all significances of the Festival. However, I am trying my bit to explain what Diwali is in a broad sense. 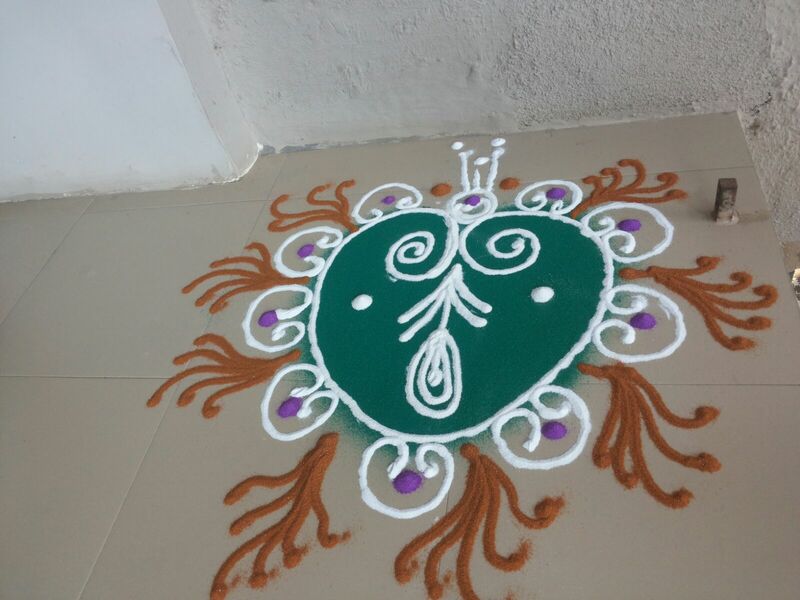 This entry was posted in This is Home and tagged Celebration, Diwali, FestivalofLights, IndianFestival. Bookmark the permalink.